Oftentimes, families ask us what will happen to their child if they spend time with us at Summit. Certainly there are a range of goals that each family has – ranging from social skills improvement to friendship making and holding to general independence. 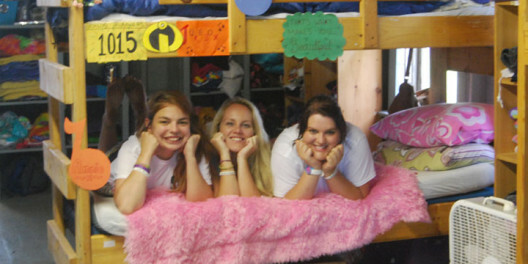 We certainly realize that camp can offer as many outcomes as we have campers. An important part of our ongoing evaluation is the recognition of our product – what do the campers really bring home? As camp was winding down our key staff were involved in a series of evaluations that reviewed this summer – from program and facilities to staff and mechanical supports. This year we also talked about outcomes – a follow through to our pre-camp sessions dealing with Best Practices ( how we serve our campers, their families, support our staff, and integrate all these components). An important session dealt with our perceptions of what our campers took from camp. The topics were both concrete and philosophic. Everyone felt that it was important that the kids were in a community that included other kids like them – that they could see they were not the only child like themselves – and that to be themselves was completely OK. We felt that our campers were also able to give themselves credit for who they are and the skills they enjoyed in a safe place that was free of ridicule or scapegoating. We also saw that friendships were renewed or built in ways that seemed unconditional – again kids accepting kids for who they were. The trust factor also revealed it self – as campers grew more comfortable in their relationships with their bunkmates as well as their counselors and supervisors. We saw many of our campers hone their own coping mechanisms – they might better tolerate another child’s behavior or last longer at a task themselves. They also did better in situations of conflict – could explain their concerns and perhaps even talk their way through the event – even with a little help form a counselor or other staff member. We saw that a number of kids also experienced safe failure – something did not go smoothly or correctly – but they were able to go through the event and accept the guidance and direction of our staff without fear of reprisal. Many of our campers found a voice –that is, were able to talk about a problem or issue – without a meltdown or shutdown. As mentioned, many of our campers improved their tolerance levels – both toward others and about themselves – they found that they were really not that bad after all. As many of us know, it is also important to be able to laugh at ourselves – and certainly numbers of our campers gathered this trait as well. Campers had a chance to gather independence – certainly as much as possible for someone their age. We also found campers more aware of personal space and enjoying greater respect for this when interacting with peers and staff. Many campers grew in their own responsibility too – whether from a job as an Super Teen camper or from chores and the all famous work wheel found in each and every cabin that sorted out daily chores. Fun and security were also highly noted – that our kids could play and find comfort in a community that had numerous safety nets designed for them. Of course all of these qualities were observed in an anecdotal fashion – too much going on to develop hard and fast data. We hope that you find your child’s own outcomes amidst these topics – and perhaps even a few more. As we know, camp is a maze of opportunities and dynamics. We value the trust that families place with us in sharing their child. We feel fortunate that we are part of a child’s overall parenting, albeit for only part of a summer. Our “Magic on the Hill” is a vigorous and almost tangible outcome. Please reach us to explore possibilities for our child to join us in this marvelous journey. Want To Work at Summit? Learn About The Staff Experience!